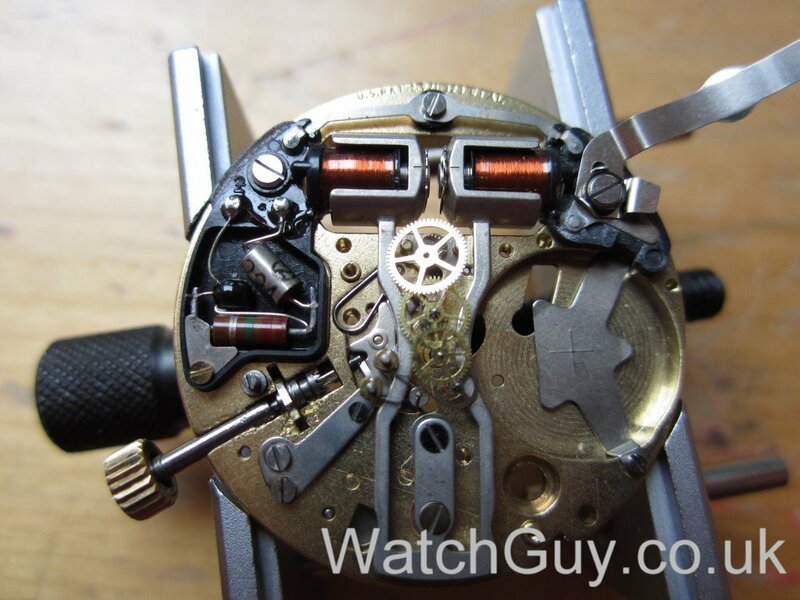 I take my “donor” watch apart and remove the coils. 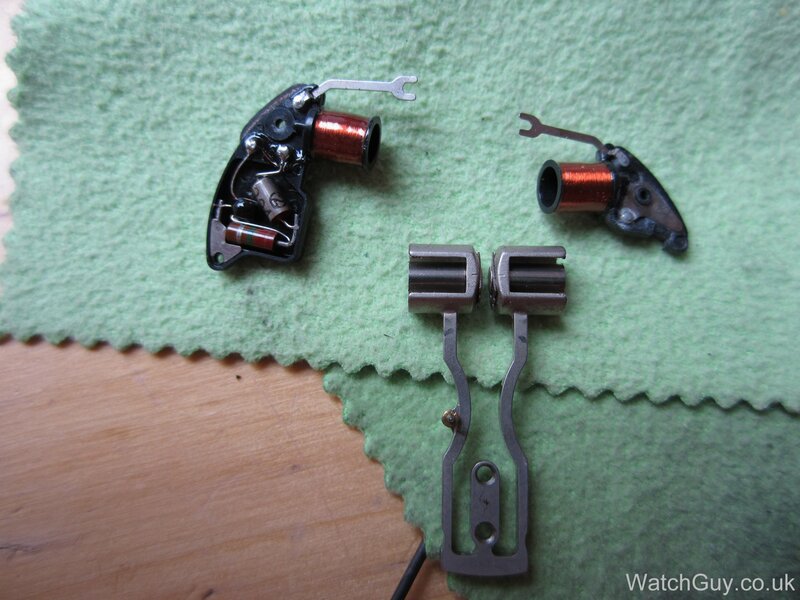 The one on the left is the component coil I need. I put the tuning fork and coils back in. Next, the wheels go in. I oil all jewels bar the ones for the index wheel (the smallest wheel at the bottom), which doesn’t get any oil. The danger of oil getting on the serrated edge is too high, so Bulova recommends not oiling those jewels. Correction: Bulova actually recommends oiling the index wheel pivots – I must have read that somewhere else. So please go ahead and oil them on your Bulova. Careful about getting oil on the wheel itself, though. As the jewels are capped, they have to be oiled before the bridge goes in. The next step is a bit fiddly – aligning all the wheel pinions so the sit properly in their jewels. I use a small oiler to nudge them in. Bridge in place, battery in, watch humming! Time to adjust the pawls so that the index wheel moves properly. This little video shows how the two fingers engage in the index wheel and drive it. No I reassemble the bottom plate with the date ring. The movement goes into the case. This has to be the coolest watch in my collection. Having grown up in the 60s, for me, this is space travel on a stick! I’ve worn it for 12 hours now, and it’s 1 second slow. I’ll let it run for a week before I get on to the fine adjustment. The Accutron 218 was manufactured between 1965 and 1972. Mine has the date code N0, so it was made in 1970. I have a 214 that runs 5 minutes fast and would like to adjust the regulator which I believe is the center two levers but I don’t know if pushing away is faster and pulling back is slowing it down. It’s fairly logical – just think about it. If the tynes of your tuning fork get longer, the tuning fork swings slower, and if the tynes get shorter, the tuning fork swings faster. 5 minutes per day might be outside of what you can adjust. My guess is that you sometimes move 2 teeth with one swing. Hi I have a Accutron n0 model which is not working at all… Check the continuity and found its not there.. can u tell me the transistor number of the particular model? I am afraid I don’t know that, either. If there’s no continuity through the coils, thats the problem, not the transistor. SOT package device will work, these parts aint critical, basically anything that’ll physically fit will work. A BC108 will electrically work, but physically completely wrong, the SOT package version would be OK. BC848A/B, SOT23 outline. Very good soldering skills are needed to replace transistors, caps etc as these coils are so very easily damaged, the wire is so fine and not skienned on the terminations, the very fact you’re soldering the coil-wires risks dissolving in the solder–the coil wire you’re soldering! Use copper-loaded solder, lead based as a minimum…. Do I have to tear off the Jewel Bridge to fix this issue now..? Not sure why the Crown Retaining Screw wont tighten anymore; any idea on what might have happened and a way to address it without having to tear half the movement apart..? 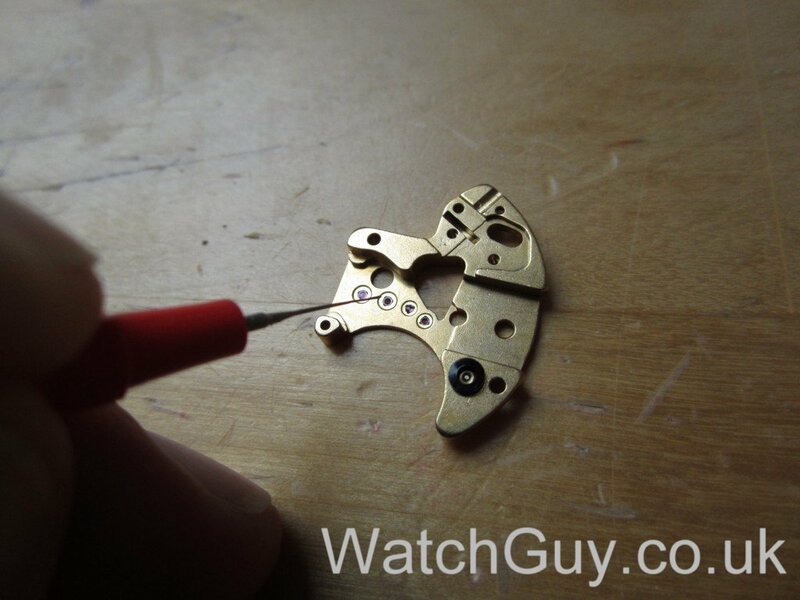 I think it’s time to involve a watchmaker if you want to save your watch … Your setting lever disengaged from the setting lever screw, as you unscrewed it too far. The dial has to be taken off, and the date mechanism taken out to fix this. If you aren’t fairly experienced, you won’t be able to do this on your own without destroying the movement. I am just happy I don’t have to take apart the Train Bridge to fix this issue..! Greetings and thank you for taking the time and effort to provide this detailed repair description. Did you do this and, if so, could you describe the process. I cleaned the jewels as they are in the he cleaning machine, checked them under the microscope, and re-oiled them. Only the earlier 218 have removable cap end-stones, Later ones are not removable but have open settings holding the bearing jewel so get cleaned in machine. Coming in a little late on this article- I came across it after being handed by father’s 218 (a wedding gift from his parents) which quit some time ago. I’ve been I’ve only worked on mechanicals to this point so your insight is greatly appreciated. Keep up the good work! You shouldn’t really try to repair that yourself. A common problem is rust on the centre tube that holds the cannon pinion, which can lead to the watch only moving the second hand, without the minute hand and hour hand advancing. As I don’t specialise in tuning fork watches, it’s best to go to a colleague of mine – Paul Wirdnam – electric.watches@gmail.com is your man. The way you store them at night can cause them to lose or gain time. If you are hanging it or storing it in a vertical position 12 o’clock up, then it will cause it to lose 6 seconds a day. If stored flat at night it should remain true. I sometimes work on mechanical watches, but the electronic ones are a mystery to me, however I’ve always found the hum and the sweep of an Accutron movement very appealing. I picked up on the other day, put in a new battery and worked immediately, but the setting mechanism is really stiff. Really difficult to turn. I’m a bit reluctant to pull it apart without some clear notion as to what the problem might be. Your discussion has given me a much clearer picture of the Accutron movement. Hopefully the setting gear just needs cleaning. Any other idea what the issue might be? Thanks – I’ll see if I can clean the stem area and castle wheel without removing them. I will look into it. Perhaps it is just dirt. Normally, it’s the second hand still moving, and the hour and minute hands not moving if the friction clutch slips. Sounds like you have a broken second wheel. No big deal. I bought recently a 218D in an auction, the guy saying it was working perfectly. It is, it humms nicely and i even checked if the battery was a 344 wich it is and new. The watch works fine up until aprox 8 pm, after wich the hour/minute hands get stuck but the seconds handle continues working normally. I move the hands. It is stuck until i re-set the time pulling the crown to the early hours of the next day. Then the watch runs perfectly until 7:55pm and it gets stuck again. Summer holidays and my usual watch guy is on holiday but I don’t he’s familiar with the Accutron. 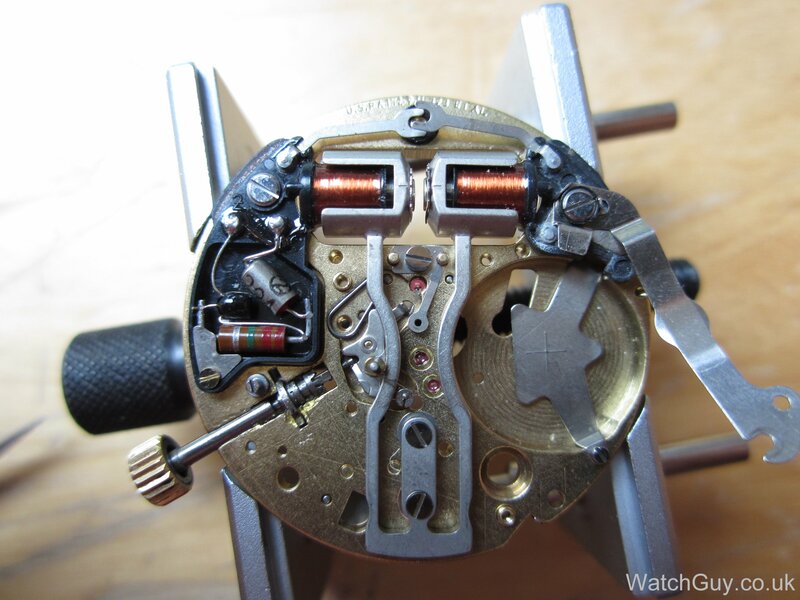 Do u think an experienced watchmaker would be able to sort this out even though not knowing particularly well the Accutron? Most likely the clutch on the canon pinion – it will have rust on it and slip. You need somebody who knows what they are doing, as these movements are very easily destroyed beyond repair. I have an Accutron “Deep Sea 666” that my wife bought for me in 1972 for my graduation from USAF flight training. Watch was serviced a little over a year ago and works perfectly. Time for a new battery and I need a case back gasket. Can anyone tell me the correct gasket. I see a G780 listed and also a G817. Movement is a 218I. Hope you already addressed this Joe (after all it was years ago ?) but I believe the correct gasket is the g799. I have the same model I believe. You have a great site. to corrosion or other causes. The corrosion fixes are the easiest. method is time consuming and most Techs don’t want to do it. Sorry I can get long winded… Enjoy your accutrons! Hi Christian, I picked up a 2181 (N4 stamped on back case) with the original box, watchband and some of the paperwork. It’s engraved on the back cover with a previous owner’s name and “25 years of service” for a company and dated 6-11-76. I put a 395 battery in it and it hums, however, the second hand doesn’t move. I tap it gingerly at the 3 or 9 o’clock positions and it advances a tad but never runs on its own. It does, however, continue to hum. What’s your impression? 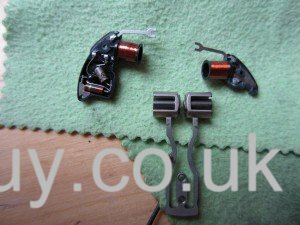 Firstly, please take the battery out asap as you can damaged the index wheel or index/pawl fingers by letting it run when the gear train is blocked. Very well, thank you much, Christian. I have removed the battery and will have a qualified watchmaker give me an estimate for a cleaning. I appreciate your expertise! You don’t have to manually wind it. 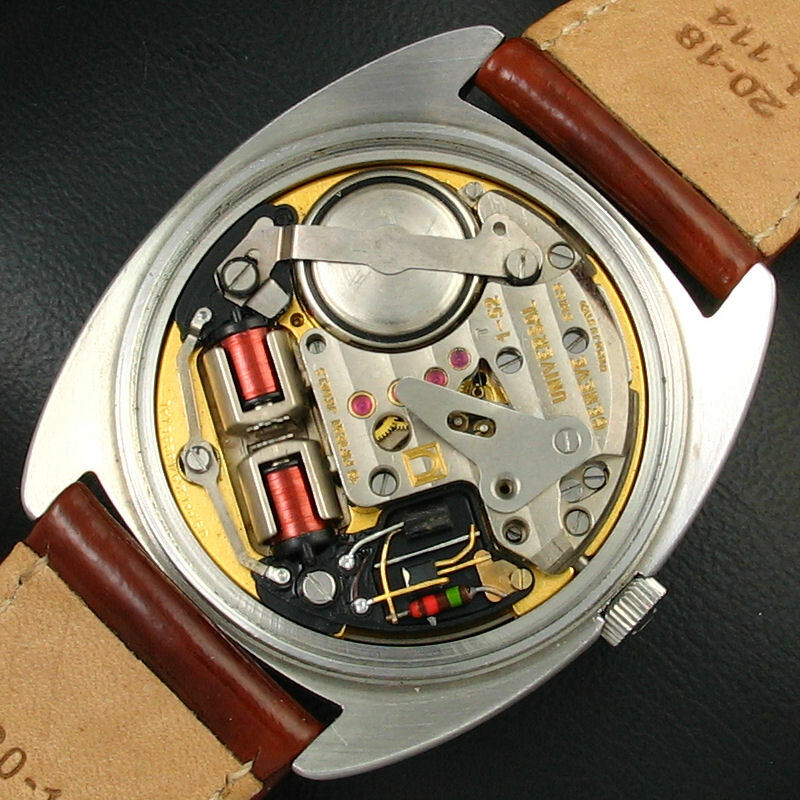 Wear it, and it will be automatically wound by the rotor on the back of the movement. If you have a glass back, you can see it turn when you move the watch. There should be no clicking sound, the “rubbing” sound comes from the reverser wheels of the auto winder. If it automatically winds when you wear it, all is well. If not, contact the dealer. The 218-family was also used by a few other makers. 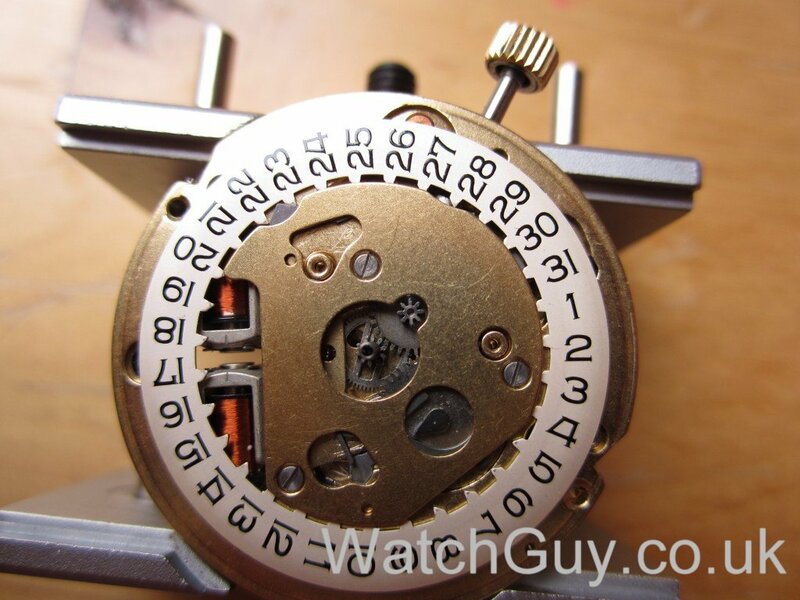 To my knowledge Universal Geneve took it the furthest with their Caliber 1-51/52/53. 2181 movement with 2 added jewels (15) and very nice decorations. These beauties are found in the Unisonic range of watches from Universal Geneve. UG even issued Chronometer versions. I want to wear my watch again. It’s a 1968 Accutron Calendar, with a silver case and black face. I remember buying it at the Army PX in Dian, Vietnam, for about $30. First question: If I cannot find a 343 mercury battery, can I use the 344 Silver Oxide? I thought I read that the 344 won’t harm the 218 movement, but you said that you use a 390. Which one should I shop for? 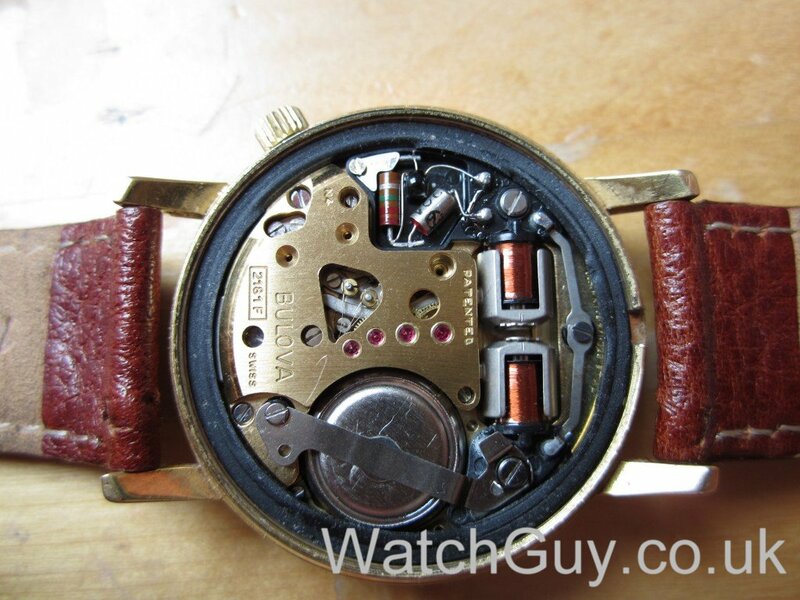 Second question: How can I clean and lubricate the watch and mechanism myself? I have rebuilt engines and transmissions, but have never taken on a watch before. It sounds like fun! Use the 344 for the accutron 218 movement. With luck, the watch will work correctly, but it might be way too fast as it could skip 2 teeth at the time due to the increased amplitude of the tuning fork. If that happens, the pawl finger has to be adjusted. If you don’t have a stereo inspection microscope, and very steady hands, I wouldn’t dare touch the movement. As an example, the index wheel has 320 teeth, and they are so small that you can’t see them below 20x magnification. You damage one, and that’s it. Wow. Great response. Thank you. I’d better let that watch be in good hands, like yours. At this point, I think I’d rather take on a 289 V-8, ’cause I don’t have the tools or experience for an Accutron. 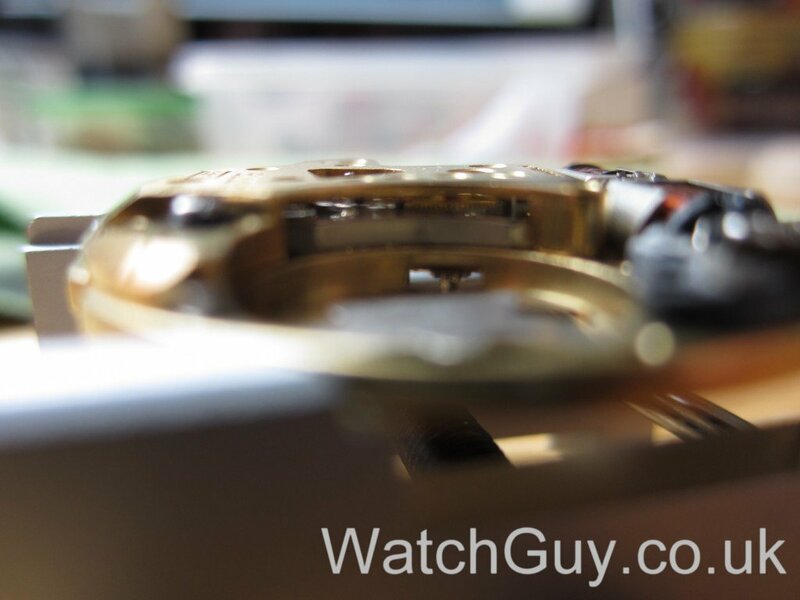 I think that all the watch needs is cleaning and lubrication. Then, as you say, it may need the pawl finger adjusted. I’m reluctant to install the 244 battery, because it hasn’t been cleaned, or running, since the early ’70’s. Where do you think I can send it for maintenance? 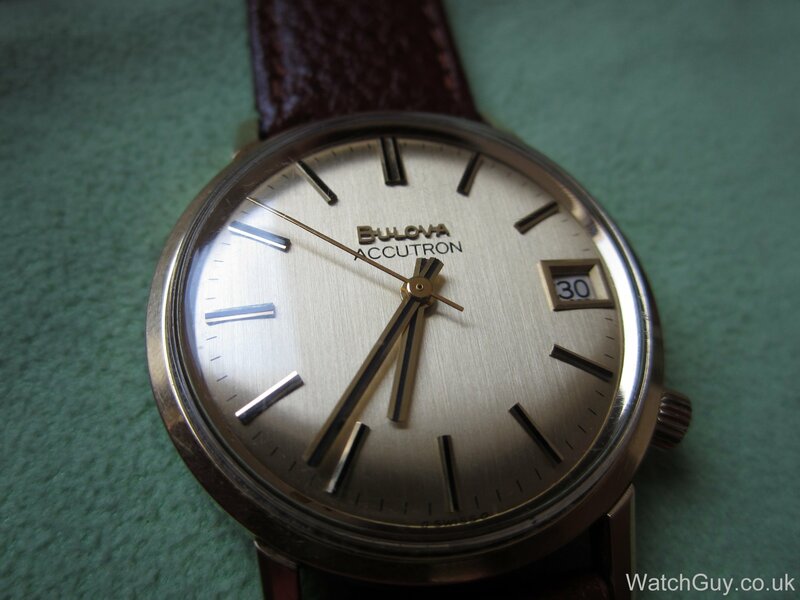 I actually have another 218 Accutron with a champagne coloured dial and pale gold hands… so I cant actually read it! Am looking for hands that might have been fitted to an Accutron but in black or or blued steel, but no luck so far – if anyone knows of a source for such things please let me know! Hi, great article there. I have just bought a non-working 2181 and it dates to 1976. Has N6 on case back and movement. I put in a new battery and it did not work, so I tapped it against my knuckle, and it moved a little, and as long as I keep tapping it runs, but stops when I do. Any thoughts on what I could do? I service my mechanical, but am wary of getting into the hummer. That basically means that the mechanical side is fine. You excite the tuning fork, and it will run for a bit. Unfortunately, you have a problem with the coils or the electronics, and that means you need parts, as you can’t repair the coils. Just wanted to say how much I appreciated these two articles. 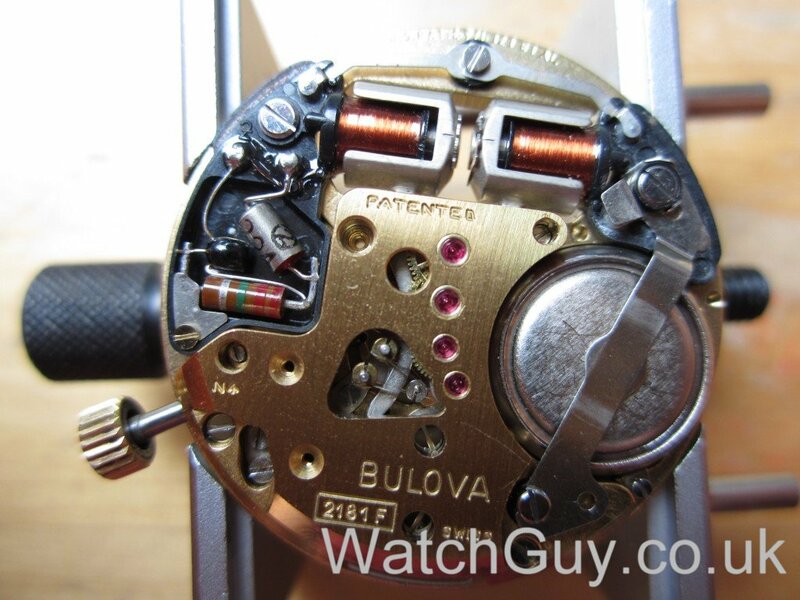 I have a Bulova Accutron 218 from 1970, and love the fact it hums, not ticks. What battery do I use as a replacement? I use a 390 battery. I can name makes and know the model numbers but aren’t so good with stuff like this. Thank you Christian! Interesting in the text you mention Not lubricating the Index Pivot jewels…. 218 manual clearly says they should be…..
–Unless they changed their mind in later years–Like manufacturers often do! The Capacitor can also give problems. Ive had two 219.1/2 that use the same 0.2uF tantalum that had gone faulty. –I replaced them with a 0805 surface-mount X7R 50V ceramic cap. (R-S Components) Works well…. You are right – it wasn’t in the manual I read that – must have been somewhere else. I guess if you oil carefully enough, the danger of any oil getting on the index wheel is small enough. The oil might actually help to dampen any swinging movement in the index wheel. Well done with the capacitor. I’m afraid I don’t know the seller. If his feedback is good, go for it! I bought a watch from him and am very pleased. It looks better than it did in the pics, it was well packaged, arrived in the time he stated and works flawlessly and accurately, (almost). I do have one issue, and that is that the hour hand does not align with the marker until about 10 to 15 minutes after the hour. I’ve noticed that the hour hand makes a small jump when the next date is indexed at midnight. Perhaps the hands were set when the date was about to change. Does anyone have any input or suggestions? The guy offered to fix it, but waiting a month or more and forty dollars postage to Bulgaria and back does not make much sense.